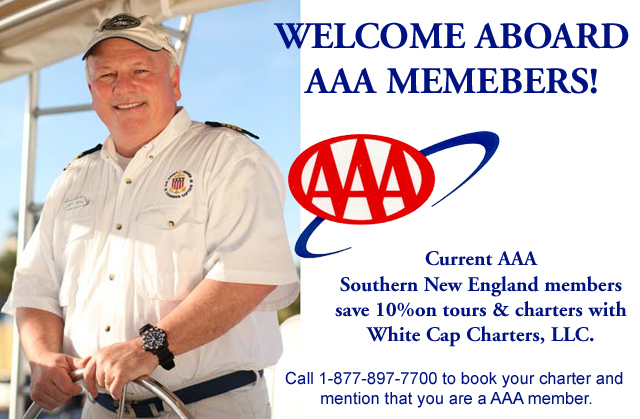 Current AAA members save 10% on tours & charters with White Cap Charters, LLC. With White Cap Charters, you can fish & explore Massachusetts Bay, Cape Cod Bay, Buzzard's Bay, Nantucket Sound & Historic Harbors like Plymouth, Marblehead and Scituate, for genuine New England fishing charters, sight-seeing tours & whale watching tours. Not a current Southern New England AAA member? Click here to subscribe or renew. Offer Restrictions: Cannot be combined with other group rates, other offers, or special event pricing. Online discounts only available through AAA.com/Discounts. Check AAA.com/Discounts for most up-to-date listings. Partnerships may change due to circumstances beyond our control. We recommend verifying discounts prior to purchase. Offers subject to change without notice. Not responsible for typographical errors.